posted by jessica	at 02:24 PM	Filed under Italian, Recipes. You can follow any responses to this entry through the RSS 2.0 feed. Both comments and pings are currently closed. THIS IS MY FIRST ATTEMPT AT READING A FOODY SITE.MY GREED FINALLY GOT OVER MY SLIGHT CONTEMPT ABOUT ANYTHING TOO ‘ON THE NET’. LouLou, have we won you over? I definitely did something wrong. My dough never seemed to rise and they ended up being a little crispy in the oven instead of rising like they should. Not sure what I did wrong. I used Fleishman’s rapid rising active yeast…maybe that was wrong? TC, Fleishman’s rapid rising active yeast should be fine. I think that’s what I used. Without being there, I don’t know which part might have gone wrong, but I would just try again because dough can be tricky. Did you check the expiration on the yeast? Did you make sure the salt wasn’t left right on the yeast? I’m not sure if I mixed it right or not Jessica. I put the yeast, flour and sugar together and stirred them up. Then I added the salt and stirred it all up. Then I made the well and added the water. Maybe thats my problem? I wasn’t really sure how I kept the salt from touching the yeast. I am a beginner cook so I may be doing something wrong in that respect. TC, that sounds right. Just try again. I’ve had strange incidences with dough where the same recipe I’ve done several times just doesn’t work one day. 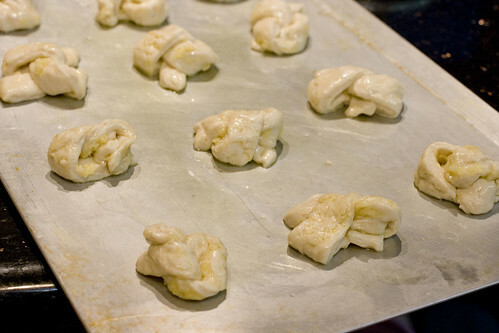 Hi – I also tried this recipe this week and had a similar problem – the first rise was ok but once tied into knots and cooked they were kind of solid and not at all fluffy. I was wondering if they should have had a second period of time to rise/rest after being shaped, as many bread recipes do? Bri, there’s no 2nd rise. 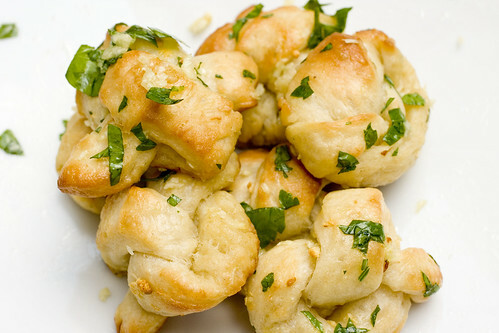 For those who may not be familiar with garlic knots, they are like a pizza crust dough so they are not fluffy like a dinner roll. They are supposed to be more dense and a little crisp, but still soft on the inside. It seems that non-US based people are having problems and I wonder if there’s just too much difference in our water or flour, or something?? Hmm, maybe! I used plain flour which is the usual Aussie substitute for all-purpose flour (i.e. has no raising agents in it). Maybe it’s just one of those bread things – I should try again sometime, because yours look delicious! Mine turned out hard and flat, more like a savoury biscuit/cookie than bread. I tried these last night! They would have been perfect and probably identical to the picture if I didn’t get distracted watching Comedy Central and leave them in about 5 minutes too long. :p They were delicious, although, and a bit crunchier than I would have planned. Next time I’ll just be sure to check on them more carefully. Bri, I hope you try again. Sometimes doughs are just not cooperative. Sara, that has definitely happened to me before. I couldn’t live without timers. Just tried this recipe after stumbling upon it and I was very pleased with how they turned out. Ended up looking just like the picture. Definitely have to make these again for a dinner function coming up! Wow, these are fabulous! I’m doing Weight Watchers currently, and have been actively (ok, obsessively) perusing recipes online looking for noms. I calculated the points for this recipe: 12.5 points for the entire recipe, or a little less than 1 point per knot if the dough is divided into 13 knots. That makes these an AWESOME accompaniment to any number of meals – or a really tasty 1 point snack. I am loving your site and your recipes… I suspect I’ll be haunting your pixels for quite some time to come. Thanks so much! I just made them they are in the oven right now. This is the first recipe I’v made from scratch. So we will see how they come out. Wings, thanks for calculating the Weight Watchers points for anyone else who’s interested. I do hope you find more recipes to enjoy from us. Let me know if you need any help. Zach, ambitious for a first time recipe! Let me know how it went! Just a little bakers trick my g’ma always used was to ‘bloom’ the yeast by adding a pinch of the sugar in the water, then dumping the yeast on the top of the water and not stirring it for 5 min or so to get the yeast reproducing so the rise will be even and smooth. it’s not completely necessary with instant yeast but ive found it really makes the bread smoother and softer. Does it have to be kosher salt or can i use table salt? Also, how do you make the salt and yeast not touch each other once the water is added? Jtexmex, it will be better if you use kosher salt but it you want to use table salt, you’ll have to use less because it’s much finer. Once the water is added, don’t worry about the yeast and salt touching. You just don’t want a pile of salt sitting directly on your yeast. 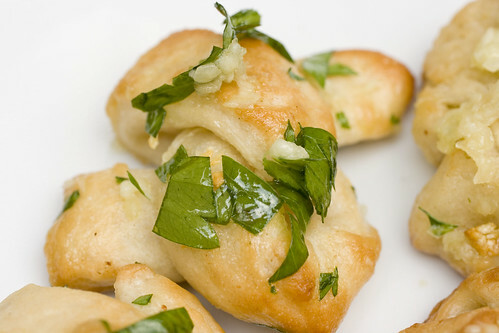 I’m making those right now, they look delicious, and I really love garlic. 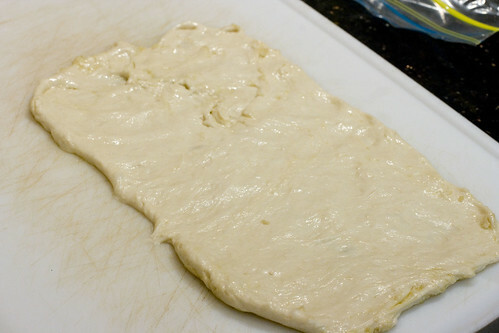 For the people having trouble with the dough not rising, make sure that the water isn’t too hot or cold. If it’s too much either way, it will kill or not activate the yeast. A test I use is to stick your little finger in the water. It should feel the same temperature. If it feels warm or cool on your skin, correct it. This has helped me many times in the past. Happy baking! student cook, what you are describing is called blooming the yeast, which is not necessary when using instant yeast/rapid rise yeast. I am definitely going to try this recipe tonight but instead of garlic cloves i’m going to use this GREAT organic garlic powder that i got off of a website cheforganics.com it would be the exact same as if i used cloves because this stuff is just so strong and flavorful absolutely great i recommend it to everybody!! Cant wait to see how this turns out!! When I stirred the flour mixture with the water the dough was a flakey mess. Most of the flour didn’t get absorbed and instead of one dough ball I had chunky floury pieces. Did I do something wrong? 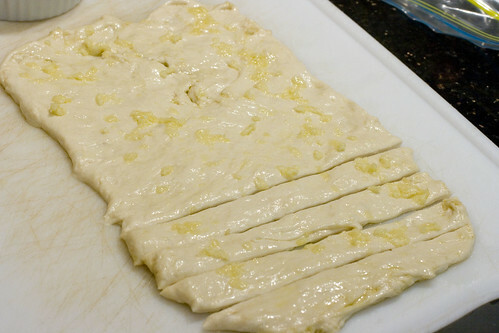 Molly, the dough will be shaggy but you should not get chunky pieces. 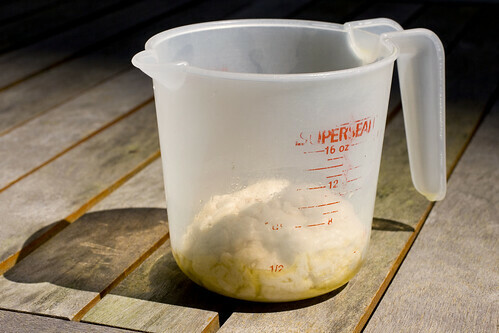 When you measure flour, do you spoon it into the measuring cup and level-off? I did not have instant yeast so I put the sugar into the warm water with the yeast and let it froth up for about 3 mins. Then I mixed in the salt and combined the mixture with the flour. The knots turned out great. Miss Ann, thanks for posting that option!! 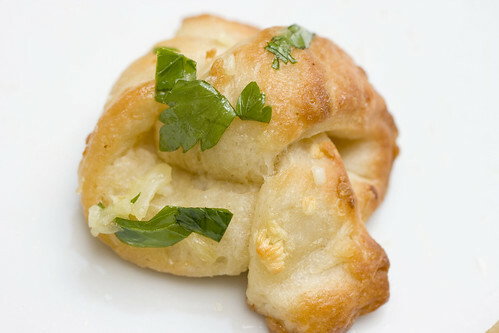 I am doing these garlic knots as I write, I just put them in the oven. However, my dough while resting (before going to the oven) did not double in size. I left them for a little over one hour. I read what you said about non-american flour, maybe that’s it (I’m from Brazil). I used wheat flour, is that the right one? I just made these. Doubled the recipe and let the dough rise for 2 hours instead of 1. PERFECT!! Thank you for the amazing garlic breath! I tried these today and I added a couple of tablespoons of the parsley to the oil, garlic mixture and spread on the dough. After the knots came out i put them in the bowl with oil and garlic spread and one tablespoon unsalted butter. They were absolutle delicious I tripled the batch and it did rise as stated. Erick, sorry for the delayed response. I have a new baby and it takes me much longer to respond now. It is white wheat flour, all-purpose. Different countries might have differences in their flour though. Conor and Barbara, I’m going to have to do the double and triple batches too. Hooray! These were wonderful. So much so that I must blog about your recipe. Thank you! Holy cow those were garlicky! I think I cut a bit too wide and only got 9 knots. Next time I need to greatly expand the mix. I’m an Aussie and had no issues with rising, but I think next time I need to make sure the dough is a more coherent lump before rising. I was very hesitant to try this recipe. I didnt relly like how it was being mixed anf thought it too wet. I gave it a shot and I was THRILLED with it. They are THE BEST knots I ever had. Thank you so much for sharing. They are amazing!!! I always add a tablespoon of honey to the liquids and let the dough rise for at least an hour. The result is a slightly crispy soft textured knot. Hope this helps. For the beginners, as Jessica said, just keep trying. It took me awhile to finally master working with dough and now I make homemade pasta too. Don’t give up because it is soooo worth it! Jessica… Thank You for this recipe. 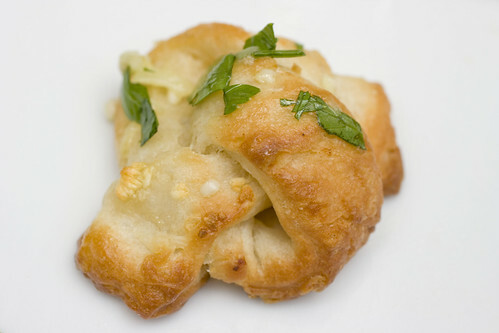 I saw a reference to Garlic Knots and don’t know how I missed these little nuggets of numminess! Did a quick search and bam! found this! And I even lived in NYC for awhile! Out here in the Midwest now and it is a snow day here. I had already decided to make Pasta Fagioli tonite and this will be a perfect little surprise for the boys tonite as they come home tired, cold and hungry! yep… bringin some East Coast Italian to the Midwest and they love it!